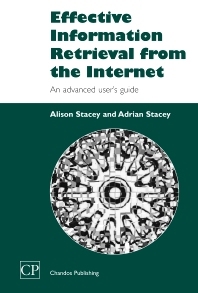 Fundamentals of information retrieval on the Internet; Query choice: pinpointing information on the Internet; Query reformulation, automation and analysis; Assessing websites for accuracy and bias; Teaching Internet searching skills to novice users. Effective Information Retrieval from the Internet discusses practical strategies which enable the advanced web user to locate information effectively and to form a precise evaluation of the accuracy of that information. Although the book provides a brief but thorough review of the technologies which are available for these purposes, most of the book concerns practical ‘future-proof’ techniques which are independent of changes in the tools available. For example, the book covers: how to retrieve salient information quickly; how to remove or compensate for bias; and tuition of novice Internet users.